Are you tired of seeing those cloudy, crusty white spots on your faucets, in your bathtub or even on your dishes? Hard water stains can show up just about anywhere in your home – whether you’re pouring your coffee from a cloudy carafe, washing dishes from a spotted faucet, or scrubbing a toilet that just doesn’t seem to come clean. Hard water stains can make parts of your home look less than ideal, but you can get it gleaming again. What causes hard water stains? Hard water is the result of having large amounts of minerals in your water, such as limestone, calcium and magnesium. While it’s safe to drink and use, it can cause problems to your plumbing and appliances, leave stains on your sinks and faucets, cause dry or itchy skin, and even cause you to be spending more on your water budget than necessary. How can you get rid of hard water stains? When it comes to cleaning away unsightly hard water stains, there are three different approaches to take. Combine equal parts regular white vinegar and water in a spray bottle. Thoroughly spray the mixture on the spotted surface – it’s completely safe to use on just about any surface other than wood. Wipe clean with a towel or rag, then buff with a clean cloth to get the shine you’ve been missing. Tip: Let the vinegar sit on the hard water spots for 5-10 minutes before wiping clean to give the cleaner more time to break down the mineral deposits. For health and environmental reasons, many people are choosing not to use common household cleaners found at your local home store, but if you choose to go this route, make sure you choose a cleaner with hydrochloric acid to get the job done on tough stains. Keep in mind this is a harsh chemical, so make sure you wear gloves to protect your hands and that the room you’re in is well-ventilated. Then simply spray the cleaner on the spotted surface, wipe away with a rag, rinse the surface with water, and dry it. In many places hard water is inevitable, but the stains it can leave behind don’t have to be. To maintain the sparkle in you home, dry surfaces after each use, such as after taking a shower or bath or splashing water in your kitchen when you’re doing the dishes. This will help clean up the mineral deposits before they can dry and leave spots. While you can wipe and clean the hard water stains all you want, it could still feel like a never-ending task. Consider adding a water softener system to your home to ultimately safe yourself both time and money, especially when it comes to your plumbing. 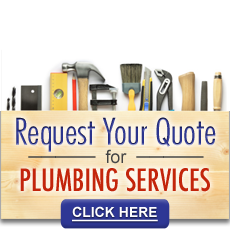 What can I do about my plumbing and other home maintenance? 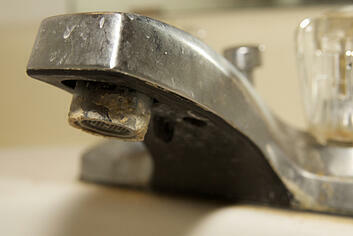 Hard water can clog pipes and cause them to malfunction, triggering costly plumbing repairs. It also could reduce the efficiency and longevity of your water heater, and increase the costs of heating water (which probably represents about 15 percent of your utility bill as it is). Start by calling your water utility company and requesting a copy of the latest water quality report. While accurate, remember that the numbers will reflect the hardness that is evident as water leaves the treatment facility – not as it travels through your faucet. In other words, it could pick up more minerals along the way. But a report will supply a benchmark. You can also purchase a water hardness test kit from a home improvement store. The simplest test comes in the form of paper strips, which you moisten and assess. If you’d like to get rid of hard water and the stains it causes, contact an Expert to schedule a consultation and learn more about installing a water softening system to protect your plumbing and home. Experts In Your Home has been serving the North State’s construction, remodeling and maintenance needs for over 30 years and provides home painting, heating & air conditioning, plumbing, electrical services & more for your home or business in the communities of Chico, Corning, Durham, Magalia, Orland, Oroville, Paradise, Red Bluff, and Redding, California.